Be the first to share your favorite memory, photo or story of Joseph Michael. This memorial page is dedicated for family, friends and future generations to celebrate the life of their loved one. 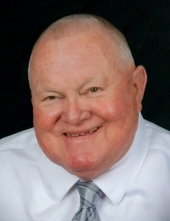 Princeville-Joseph Michael “Mike” Cafferty, age 76, passed away on Monday, January 21, 2019 at his residence. Mike was born February 7, 1942 in Peoria, the son of Joseph Michael and Josephine (Campion) Cafferty. He married Dianne Baker on January 30, 1965 in Peoria. She survives. Also surviving are their 6 children; Carrie Cafferty of Dunlap, Casey Cafferty of Peoria, Christian (Danielle) Cafferty of Peoria, Cathleen Cafferty of Princeville, Cleary (Katey) Cafferty of Princeville, and Celly Cafferty of Peoria, as well as 5 grandchildren; Caylie, Ryan, Reilly, Dillon and Morgan. Mike worked in the accounting department of WABCO for over 20 years and at the Bradford Banking Company until his retirement. He was a Third Degree Knights of Columbus member in Bradford, President of the Camp Grove Water Company and a volunteer firefighter in Camp Grove, IL. He was an avid Notre Dame sport enthusiast and was fiercely proud of his Irish heritage. He loved the Cubs and would arrange bus trips to see them. He was a member of St. Jude Catholic Church. A visitation will be from 5:00 PM – 7:30 PM on Thursday, January 24, 2019 at Wright & Salmon Mortuary. A Funeral Mass will be at 11:00 AM on Friday, January 25, 2019 at St. Jude Catholic Church, with a one hour prior visitation. Fr. Robert Rayson will officiate and cremation rites will follow services. A burial of cremains will be at a later date at St. Patrick’s Cemetery in Camp Grove, IL. Memorials in Mike’s name may be made to the American Diabetes Association. To send flowers or a remembrance gift to the family of Joseph Michael "Mike" Cafferty, please visit our Tribute Store. "Email Address" would like to share the life celebration of Joseph Michael "Mike" Cafferty. Click on the "link" to go to share a favorite memory or leave a condolence message for the family.